SodaBottleOpenerWala has not only got Parsi cuisine to Delhi, a city that has just about 600 Parsis, but also an insight into Parsi culture. As delicious as the Navroz Bhonu is at the restaurant, I particularly enjoy my tete-a-tete with Chef Anahita Dhondy on the occasion. All over the world Navroz, or the Parsi New Year is celebrated to usher in the spring season, and the date typically is 21st March. But Anahita explains that for the Indian Parsis, Navroz is celebrated in August because they started their traditional calendar when they landed in India. And while Parsi food is primarily of Persian/Iranian lineage, there is also some Gujarati influence since that’s where their ancestors had first settled. Food and drink is an integral part of any celebration, but for Parsis even more so. Friends and family gather together for a bhonu – a buffet/thali meal of traditional treats. Depending on the host’s generosity and financial status there will be dishes made with mutton, chicken, fish and egg. So while a Navroz thali may vary in different households, you will almost always be served eggs and fish. “In Persia one will find a lot of meat, but fish comes from the Gujarati influence, and is considered auspicious,” says Anahita. What you will not find in the Navroz Bhonu is the dhansak. “It is usually eaten on the 4th day of someone’s passing away and hence not served at auspicious occasions,” she reveals. At SodaBottleOpenerWala, they have gone all out with their Navroz Bhonu. There are two options – vegetarian and non-vegetarian. I’ll tell you in detail about the non-vegetarian platter since that’s the one that I order, but I’ll also tell you about the vegetarian dishes in the other since I got to taste those too! 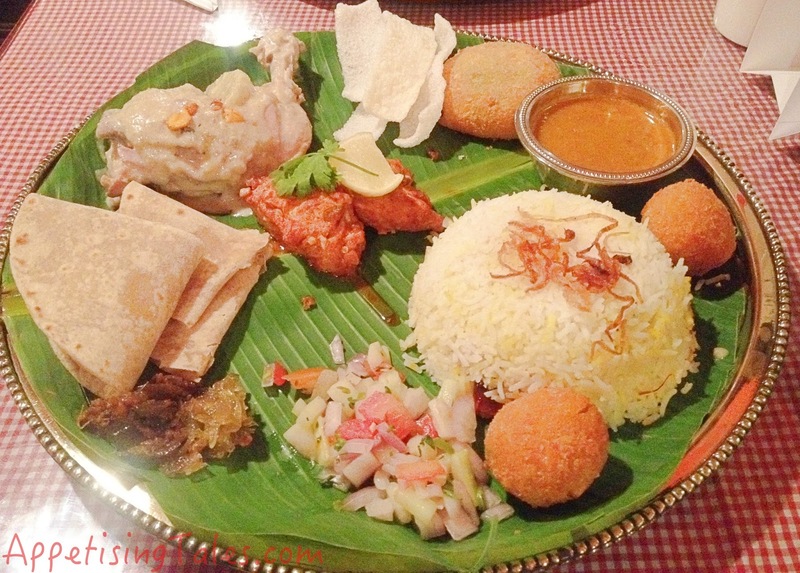 Although everything is served together – since it is a thali – there are different courses on the platter. Of course, you can have anything in any order but Anahita guides us with the traditional combinations. So we start with the Saria or rice papad with a Brinjal Pickle and Doodhi no Murabbo. Both, the pickle and murabbo, are homemade and make for a perfect accompaniment to the crisp papad. If vegetables like brinjal and doodhi (lauki/bottlegourd) can be transformed with such wonderful flavours I can guarantee that no one would turn their nose up when these are mentioned. Then there’s Chutney Eeda na Pattice, or a golden fried potato pattice stuffed with a lovely filling of spicy green chutney and eggs. Tareli Macchi, is a Parsi-style fish with a tangy, garlicy marinade. As the name suggests it is usually shallow fried, but the health conscious folks would be happy to know that here it is baked. 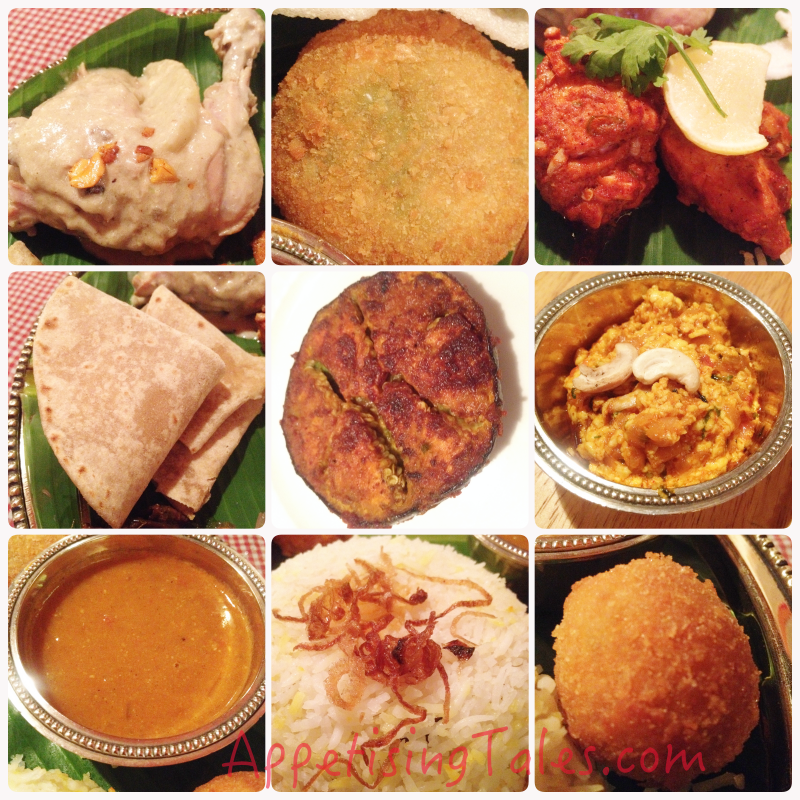 Top: Badami Chicken; Potato Pattice; Tareli Macchi. Middle: Rotli; Ravaiyyan; Paneer Akuri. Bottom: Masala ni Daar; Mutton Pulao; Chicken Kevab. Badami Chicken is cooked in a rich, almond, cashew and coconut milk gravy and goes very well with the Rotli, or soft, thin unleavened chapatis. The mound of rice that is prettified with caramelized onions has a lovely surprise sitting under it - succulent and flavourful pieces of boneless mutton! This item is delicious on its own, but you will also enjoy with it the Masala ni Daar or the classic Parsi preparation of lentils and vegetables. Finally, there are Chicken Kevabs or golden-fried balls of spiced chicken mince. 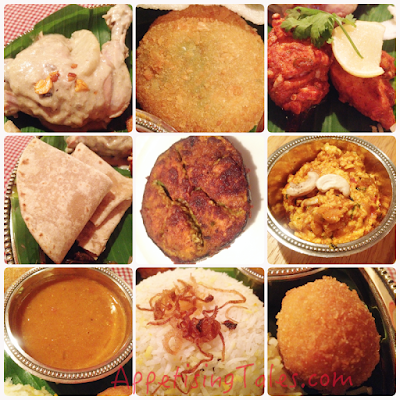 From the vegetarian thali I try the Paneer Akuri and Ravaiyyan. While the former is scrambled cottage cheese in an onion tomato masala, the latter is another delicious version of the brinjal. This panfried and baked brinjal is stuffed with a spicy chutney. And of course, no Parsi platter is complete without the Kachumbar – a simple salad of tomato, onions and cucumber. Before moving on to desserts, I have to tell you that alcohol forms yet another integral part of any Parsi celebration. While there is a range of regular alcohol available at the restaurant, I suggest you try the Qwirky Cocktails. 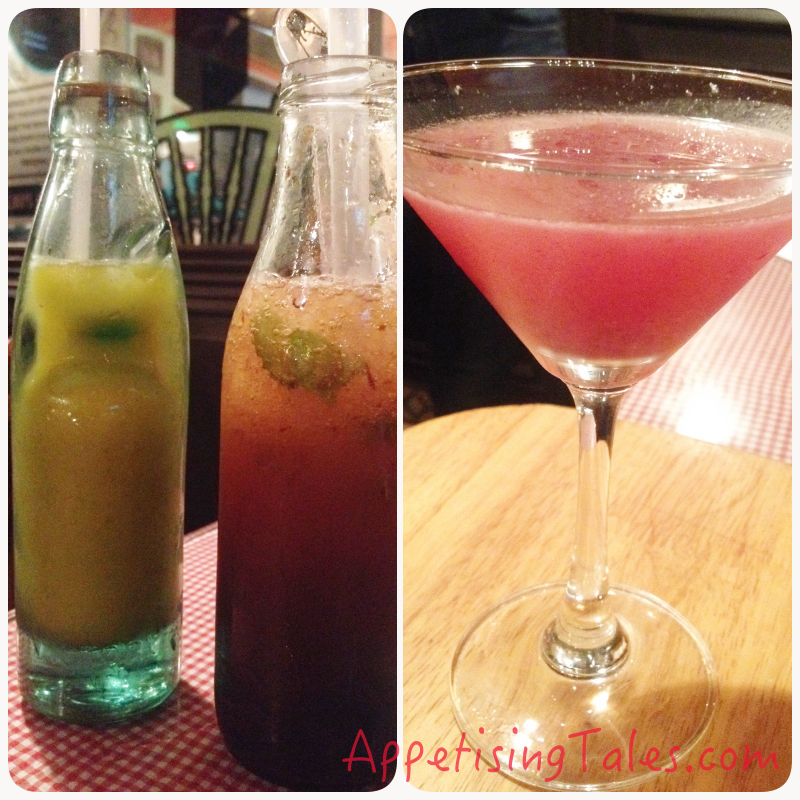 My favourite is the Parsiana that’s made with vodka, plum and oranges. I like its tangy-sweet flavour and chunks of fruit. But do also check out the specials of the day. The specials that I try are the Rustam Bantawala that is served in a banta bottle and the kokum-based Sol of Colaba. Rustom Bantawala; Parisana; Sol of Colaba. Finally, the desserts. Ravo is made for almost every auspicious Parsi festival. 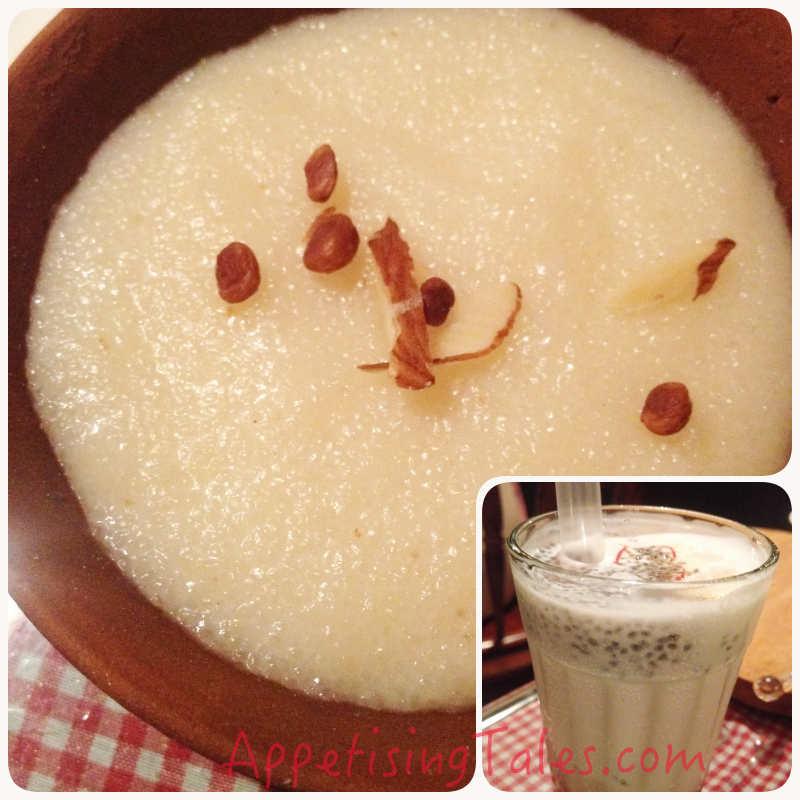 Even non-Parsis are familiar with this sweet semolina milk pudding that is lightly garnished with dry fruits. The Falooda, however, is very different from the sweet vermicelli that we are used to having with kulfi. This one is a cold beverage flavoured with rose and topped with basil seeds. 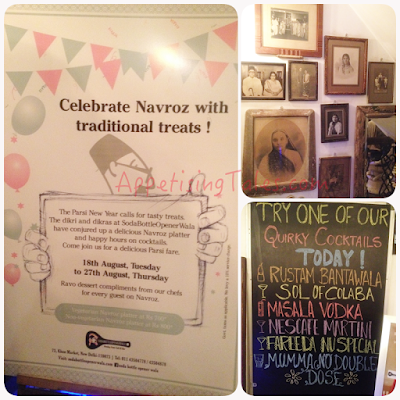 So even if you have been to SodaBottleOpenerWala before, I would recommend that you go for the Navroz Bhonu. You’ll be treated to some traditional dishes that you will usually not find on the menu. The well-priced thali exposes you to the varied flavours that make up Parsi cuisine. Oh, and it’s on only ‘til 27th, August 2015. Don’t miss it! Prices: Rs 700 for Vegetarian Platter; Rs 800 for Non-vegetarian Platter.